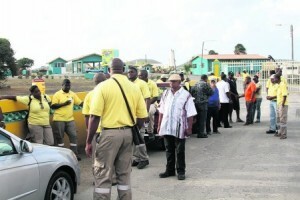 WILLEMSTAD – There is now an accord on the major outlines in the negotiations for a collective employment agreement (CAO) for the waste management company Selikor. The negotiations are between the unions BTG, ABVO and the company’s management. This accord comes after the employees were on a 24-hour strike because the parties could not agree on the financial details of the CAO. The negotiations for the new CAO started in November last year. The involved parties indicated that the negotiations have been difficult but last week it resulted in a deadlock. The unions then gave the company’s management an ultimatum which expired last week Friday. The employees then laid down their work demanding Selikor to continue the negotiations with the unions. Director Wesley Kook contacted the unions and after some humming and hawing, they reached an agreement on the outlines of the CAO. These outlines have yet to be worked out.